The past year was record-breaking for specialty drug approvals, with 39 new drugs approved by the FDA. These include 18 new cancer therapies and 10 novel drugs to treat rare conditions, 5 new drugs to treat HIV, 3 drugs for thrombocytopenia, a new biologic for psoriasis, and an oral drug for rheumatoid arthritis. 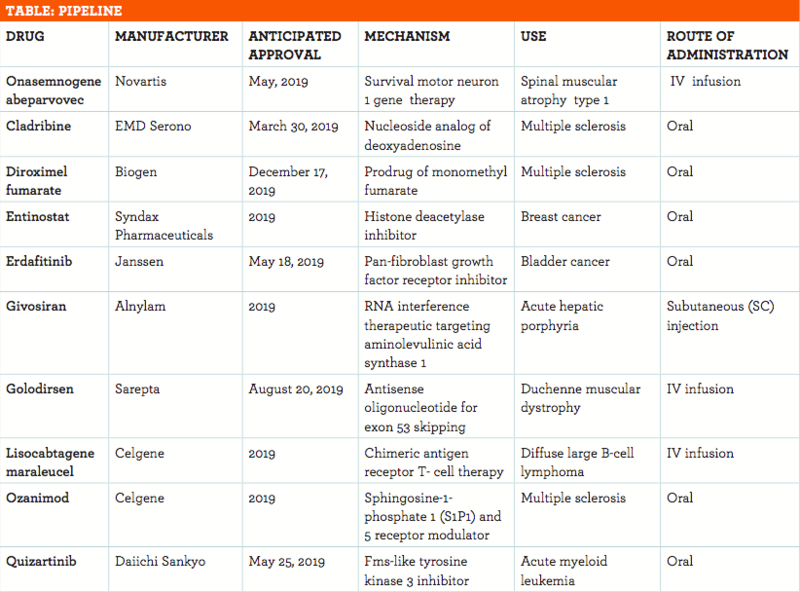 The FDA approved 18 novel cancer medications in 2018, including several oral targeted therapies. Agios Pharmaceuticals’ ivosidenib (Tibsovo), an isocitrate dehydrogenase-1 (IDH1) inhibitor, was approved on July 20 to treat adults with relapsed or refractory acute myeloid leukemia (AML) with an IDH1 mutation. Approximately 21,000 patients are diagnosed with AML annually in the United States, and between 6% and 10% of patients with AML have IDH1 mutations. Ivosidenib is the only IDH1 inhibitor on the market and costs approximately $313,000 per year. Pfizer’s dacomitinib (Vizimpro) is an epidermal growth factor receptor (EGFR) tyrosine kinase inhibitor that was approved on September 27 for the first-line treatment of patients with metastatic non–small cell lung cancer (NSCLC) with an EGFR mutation. Approximately 190,000 Americans receive a NSCLC diagnosis each year, and approximately 10% to 35% have an EGFR mutation. Dacomitinib competes with other EGFR inhibitors and costs approximately $178,000 per year. Ten new orphan drugs for rare conditions were approved in 2018, not counting orphan cancer drugs. GW Pharmaceuticals’ cannabidiol (Epidiolex) oral solution was approved by the FDA on June 25. It is a derivative of marijuana, which does not produce psychoactive effects, to treat 2 rare and resistant forms of epilepsy, Lennox-Gastaut syndrome (LGS) and Dravet syndrome (DS). Between 14,000 and 18,500 patients in the United States have LGS and approximately 8000 have DS. Epidiolex is approved for use in children as young as 2 years. It was classified by the Drug Enforcement Administration as a Schedule V controlled substance, which is the lowest restriction classification. Epidiolex costs approximately $32,000 per year, but varies based on the patient’s weight. Alnylam’s patisiran (Onpattro) and Ionis Pharmaceuticals’ inotersen (Tegsedi) were approved by the FDA on August 10 and October 5, respectively. They treat polyneuropathy caused by hereditary transthyretin–mediated amyloidosis, which affects approximately 3000 Americans. The condition, which typically takes many years to accurately diagnose, can cause disability, pain, and organ damage. Patisiran is a ribonucleic acid interference drug that is given by intravenous (IV) infusion every 3 weeks. Inotersen is an antisense oligonucleotide that is given once weekly by subcutaneous injection. Both drugs cost approximately $450,000 per year. In 2019, watch for more cancer drugs to affect the market. In addition, several new orphan drugs and oral drugs for multiple sclerosis (MS) are expected to gain approval. More information about select specialty pipeline medications can be found in the Table. Karyopharm Therapeutics’ selinexor is in a new class of medications called selective inhibitor of nuclear export compounds. It causes the accumulation of tumor suppressor proteins in the cell nucleus, leading to cancer cell death, and is pending approval for the treatment of patients with penta-refractory multiple myeloma (MM). Each year in the United States, approximately 30,000 patients receive an MM diagnosis. Often, patients with MM relapse after the first and subsequent rounds of therapy. Selinexor will be used in patients who have previously received several MM medications, including bortezomib (Velcade, Takeda), carfilzomib (Kyprolis, Amgen), lenalidomide (Revlimid, Celgene), pomalidomide (Pomalyst, Celgene) and daratumumab (Darzalex, Janssen). It is an oral medication that is taken twice weekly in combination with dexamethasone. Approval of selinexor is expected by April 6, 2019. Janssen’s erdafitinib is a pan-fibroblast growth factor receptor (FGFR) inhibitor for the treatment of patients with locally advanced or metastatic urothelial cancer and certain FGFR genetic alterations whose tumors have progressed after prior chemotherapy. Approximately 81,000 patients in the United States have bladder cancer diagnosed each year. Urothelial cancer is the most common type of bladder cancer, and approximately 20% of patients with urothelial cancer have an FGFR mutation. Patients with an FGFR mutation have poor prognoses because they typically do not respond well to currently available therapies. Erdafitinib, an oral medication taken once daily, is a breakthrough therapy with approval expected by May 18, 2019. Novartis’ onasemnogene abeparvovec is a DNA- based gene therapy that delivers a functional copy of a human survival motor neuron 1 (SMN1) gene to treat children with spinal muscular atrophy (SMA) type 1. SMA type 1 is a life-threatening neurodegenerative disease in which babies have difficulty breathing and swallowing and cannot sit, crawl, or walk. Most children with SMA type 1 do not survive or they need permanent ventilation support to breathe by 20 months of age. The drug has demonstrated strong efficacy in an early-phase study. According to AveXis, a subsidiary of Novartis, approximately 300 children per year in the United States will be candidates for treatment. Onasemnogene abeparvovec is expected to cost between $1 million and $3 million for the 1-time IV infusion. The FDA action date is May 2019, and early approval is expected. Pfizer’s tafamidis meglumine is expected to be the first drug approved for the treatment of cardiomyopathy caused by transthyretin-mediated amyloidosis. It is for patients with the hereditary form of the disease as well as those who have the wild-type form of the disease, which may occur as people age. This is a rare condition that causes progressive heart failure and premature death. Tafamidis, an oral medication taken once daily, works as a transthyretin stabilizer to reduce deposits of amyloid fibrils in the heart. In a pivotal clinical study, tafamidis resulted in a 30% reduction in the risk of death and a 32% reduction in the rate of heart-related hospitalization compared with placebo. Approval is expected in mid-2019, and it could rapidly become the standard of care for these patients. Two new oral drugs for MS are expected to be approved in March 2019. EMD Serono’s cladribine works by reducing certain white blood cells that are thought to contribute to MS. It has a unique dosing regimen, with patients taking cladribine once daily for 4 or 5 days in weeks 1 and 5 of the first year. This regimen is repeated a year later, and no additional dosing is required in years 3 and 4. The FDA previously issued a complete response letter for cladribine in 2011, requesting additional safety data. Approval of cladribine for relapsing MS is expected by March 30, 2019. Novartis’ siponimod is a sphingosine-1-phosphate receptor modulator that targets subtypes 1 and 5 in the treatment of secondary progressive MS (SPMS), for which there are no drugs currently approved. Approximately 1 million Americans have MS, approximately 85% of whom have relapsing forms of MS (RMS); however, over 20 to 30 years, RMS gradually transitions to SPMS in close to 75% of patients. SPMS leads to progressive disability that is primarily independent of relapses. Siponimod is taken once daily after an initial 6-day dose titration. In a clinical study, siponimod reduced the risk of 3-month disability progression by 21% compared with placebo. Approval of siponimod is expected in March 2019.